BBC NEWS | UK | Magazine | Who's afraid of the BNP? With two seats in the European Parliament the BNP has made a leap towards the political mainstream. But, asks Kenan Malik, should those who have so far shunned the party now engage with them? 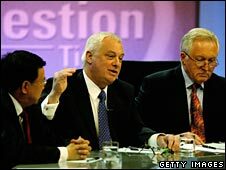 Next month Nick Griffin, leader of the British National Party, will take his seat at the BBC's Question Time table. Around that table there will be the justice secretary and Labour MP, Jack Straw, and representatives from the other two main political parties. Mr Straw's decision to share a platform with the BNP is a reversal of Labour Party policy and has prompted soul searching among some members. Until now, Labour has refused to appear alongside the BNP and Home Secretary Alan Johnson has publicly stated that he would not debate with someone he considers to be a racist. For the BBC, the success of two BNP candidates - including Mr Griffin himself - in the Euro elections in June meant that an invitation to Question Time was inevitable. Ric Bailey, chief political advisor to the BBC, says that the corporation "cannot discriminate between parties according to their policies. That would be a breach of impartiality". With others, however, the impartiality argument cuts little ice. Chris Keates, general secretary of Britain's largest teachers' union, the NASUWT, which has been running a campaign to stop the BNP, is outraged at the idea of Nick Griffin on Question Time. "The BBC can quite legitimately make a distinction between the BNP and other political parties, and not give them a platform to promote racial hatred, intolerance and violence," she says. The controversy over Question Time puts in sharp focus a debate that has been brewing since the BNP's success in the Euro elections: how should a liberal democratic society respond to an organisation such as the BNP? Should the political mainstream ostracise the BNP, or engage with it? And if engage, how? Unlike in other European nations, the far right has never won mass support in Britain, nor tasted electoral success. 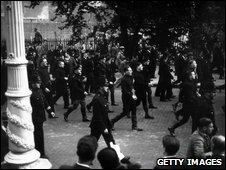 Oswald Mosley's Blackshirts in the 1930s and the National Front in the 1970s were openly racist organisations, many of whose members were involved in violent actions. Compared with their Continental cousins, however, they were marginal groups, with virtually no political presence. The roots of today's BNP lie in that political tradition. Formed in 1982, it was, in its early years, very similar to the NF in its ideas, policies and support. 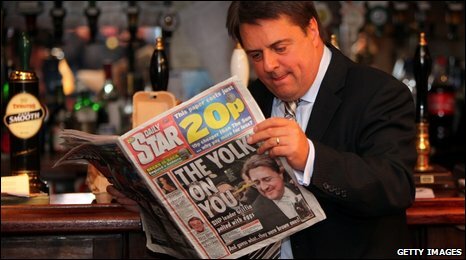 From the late 1990s onwards, however, the party embarked on a programme of "modernisation" under its new leader, Nick Griffin. Learning from the successes of French Front National, the party tried to give up its skinhead image, swapping bovver boots for sober suits. Nick Griffin says the bovver boot image of the BNP is "something created mainly by hysterical media lies" and insists the BNP is no longer a racist party. How genuine the conversion has been may be gauged by the party's constitution which is still, and I quote from it, "wholly opposed to any form of racial integration between British and non-European peoples" and believes in restoring "the overwhelmingly white make up of the British population that existed in Britain prior to 1948". While one might rightly be cynical about the rebranding of the BNP, what has indubitably changed is the nature of its support. During June's Euro elections, the polling organisation YouGov conducted a survey of about 32,000 voters, including more than 1,100 BNP supporters. About half the BNP voters, YouGov found, were out-and-out racists, many of whom would probably have supported the party in its pre-modernization days. But they've been joined by a swath of new supporters whose hostility towards immigrants is shaped less by old-fashioned racism than by a new-fangled sense of fear and insecurity. Many are traditional Labour supporters who now feel abandoned by the political mainstream, anxious about their future and distrustful of any figure of authority. Little will sway the views of the hard-line racists, YouGov's Peter Kellner believes. But those drawn to the BNP because they have become alienated from the mainstream political process should not simply be dismissed as bigots by the mainstream. It is the failure to engage with them, and with their fears and concerns, that helped pave their way to the far right. But just as fear is driving many towards the BNP, it is also shaping much of the response to the BNP. The result is an incoherent and illiberal reaction, vacillating between demonising the BNP and pandering to its prejudices. Some critics of the BNP fear that allowing the party into public forums, such as Question Time, can only increase its support. The writer and economist Philippe Legrain is unimpressed. "It shows a complete lack of trust in the British people to suggest that if they're exposed to racist views on television, they'll all be swayed by them." The best way to deal with obnoxious views is through open debate, not censorship, he says. Others fear that support for the BNP will continue to grow unless mainstream politicians accept that indigenous Britons are being unfairly treated. It's a view that has led many politicians who are not racist nevertheless to echo the claims of the far-right. 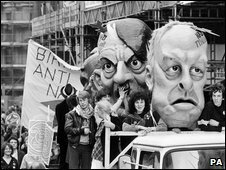 When Gordon Brown talked of "British jobs for British workers", he adopted a slogan last heard on National Front demonstrations in the 1980s. For Mr Legrain, the real problem is not the BNP itself as an over-reaction to its relatively minor electoral successes, an over-reaction that betrays a lack of confidence by mainstream politicians in both the electorate and in basic liberal democratic values. "I would have more confidence in people and more confidence in the power of the arguments." Kenan Malik is a writer on issues of race and multiculturalism. We must engage with the BNP. Give them a voice, so they may be judged by what they actually say on a bigger stage. They do raise the profile of some important issues that mainstream politicians don't want to face - the lack of integration of many ethnic groups, (many of which don't want to integrate in my view), immigration policy and disenfranchisement of the white working classes. While these issues are left unspoken, the BNP will make mischief with them. We live in a democratic society. The BNP are a legitimate political party. Like them or not, they must be allowed to participate on Question Time and other such platforms. If other political parties, or their MPs boycott such events, then they are weak and undemocratic, so should not be MPs. The BBC are absolutely correct to include the BNP in Question Time. Chris Keates needs to remember we live in a democracy and that implies a great many freedoms, some he appears to object to, many sadly being lost. It is surely the presence of the BNP, and its ability to speak and stand as a representative of parts of the UK that establishes us as a free democracy. What a sad day if the likes of Ms Keates were able to decide who may speak and what they may say. That being the case he might consider what differentiates his position with that of the BNP, in particular should they campaign for greater freedom of speech and more democracy. I do not want anyone telling me that I am not allowed to hear what the BNP has to say. I will make up my own mind rather than someone (in this case) on the Left doing it for me. Misinformation and downright lies spread around the media from the mainstream political parties have only increased the interest in the BNP. The people can see through their lies and with this it has undermined their very presence to represent the voting public of the UK. You cannot win on lies and misinformation. Engage in an open forum and if the mainstream parties' views are true to their word the people will then believe and re-engage with them. If not, they will be found out and the people will move away. Have they the guts to do this... The people, the voting public are waiting. Where are you..
Like it or not, if we are to consider ourselves a truly democratic country, then all views and opinions, no matter how twisted and obnoxious others feel them to be, are as valid, in terms of a debate, as any other. The "hardline racists" will not be swayed by a debate on Question Time, but those who feel ignored by the mainstream parties, perhaps feeling the BNP is listening and responding to issues which matter to them, such as immigration, will be totally horrified by their openly racist stance. But what are the BNP's other policies? What of schools, hospitals, transport, welfare, police, the armed forces, the economic crises, Iraq, Afghanistan, the Middle East peace process, the recent flair of trouble in Northern Ireland and all the other major areas which require a competent government. By censoring the BNP or refusing to meet them, politicians give the impression, whether true or not, that they are afraid to face them in an open debate, fuelling the thought in people's minds that the BNP maybe 'on to something'. What we need to remember here is that a democracy exists to exercise the will of the people - not the will of those already in power. If the people want the BNP, then unfortunately they have just as much right to be in power as any other group. If people want to defeat the BNP and stop it's message of hate, then as Mr Malik so astutely observed, political parties must pander to those who are rallying under the BNP's flag not due to hatred or bigotry, but due to fear and ignorance. We must always respect the fact that the BNP has just as much right as any political party. If we start to persecute their freedom of speech and expression (however perverse the message they give), then we run the risk of becoming something even worse than the BNP. It is not about being "swayed" as suggested by Legrain, but waking the widespread racism that still exists in Britain today. Before Harvey Milk, Lesbians and Gay voices were not heard in a democratic political structure. It needed mainstreaming before an uprise of confidence in the LGBT community. This is now happening for racists; and while groups like Stonewall gained a voice to fight oppression, the BNP's primary aim is to restrict and oppress. I think anyone who thinks that a large proportion of the public who watch this debate won't be at least partially convinced by the arguments of the BNP is slightly naïve. The vast majority of people are egocentric, if not wholly on their own behalf then at least on behalf of their family and friends, and many of the policies of the BNP will appeal to the naturally self-preserving instincts of the public. We know that this can happen, it certainly has before (albeit not in this country). This is compounded by the fact that many people have no faith in the mainstream political parties.